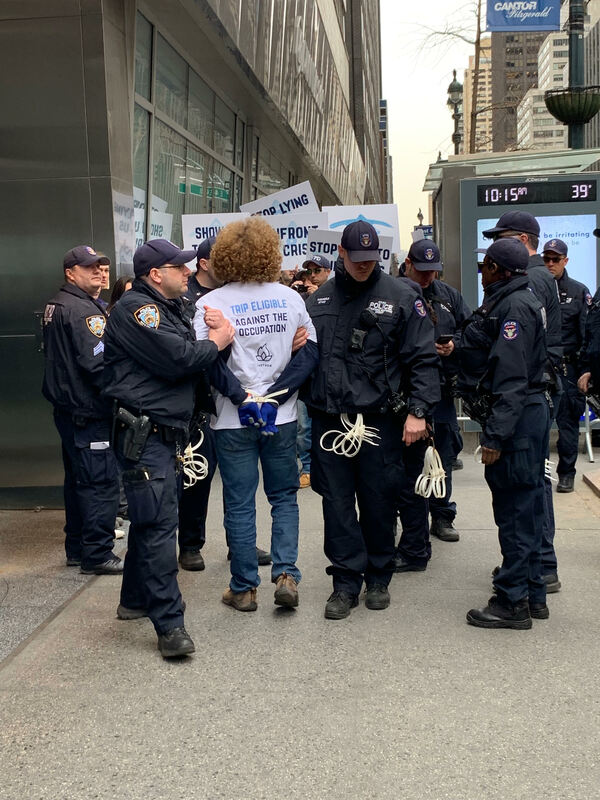 Escalating a campaign to have Birthright Israel deal more forthrightly with Israel’s policies on the West Bank, more than 100 protesters demonstrated outside of Birthright Israel’s offices Friday morning, shutting down traffic on Third Avenue and blocking the entrance to the building. By the end of the hour-and-a-half-long demonstration, 15 college students were arrested for disorderly conduct. The protesters, organized by IfNotNow, were there to challenge Birthright, which organizes free trips to Israel for young American Jews. 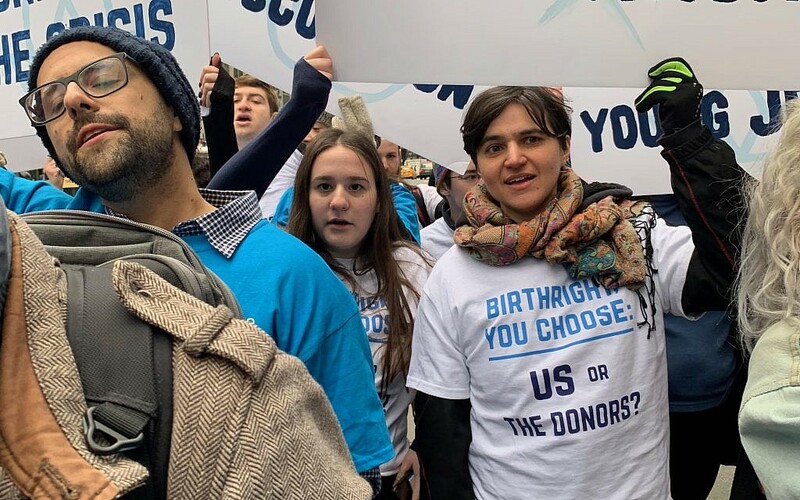 They say that Birthright punishes participants for asking questions about Israel’s treatment of the Palestinians, and they are calling on the organization to “choose us or the right-wing donors” and educate trip participants about Israel’s occupation of the West Bank. Birthright gets funding from billionaire philanthropist Sheldon Adelson, who supports Republican causes and candidates in the U.S. and publishes a daily newspaper in Israel that is seen as being favorable to Israeli Prime Minister Benjamin Netanyahu. 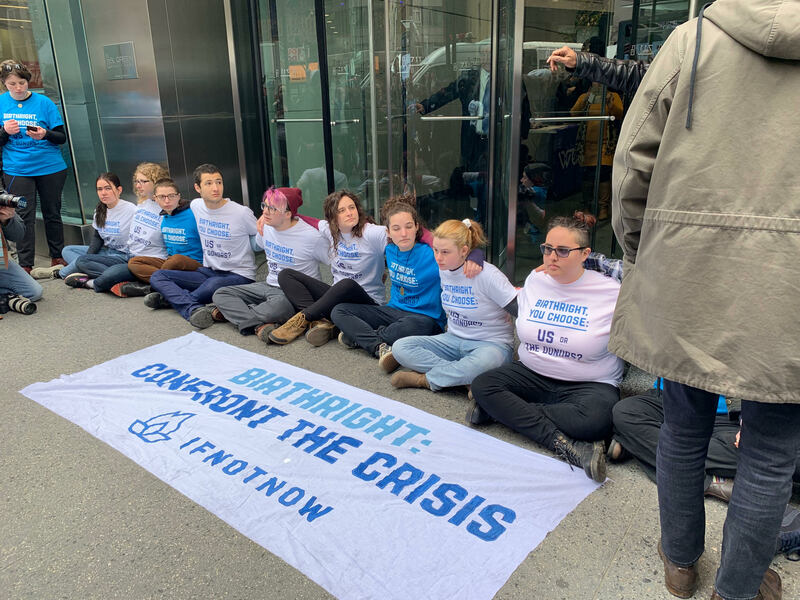 “Hey Birthright, tell us the truth, hey Birthright, we are the youth,” they chanted outside Birthright’s office building on Third Avenue between 44th and 45th streets. This was the culmination of a yearlong campaign by IfNotNow against Birthright. Over the past year, activists have handed out information about the occupation to Birthright participants at airports, several participants have walked off Birthright trips and college students have organized protests on college campuses across the country. This was the largest demonstration against Birthright to date and perhaps one of the most disruptive demonstrations ever launched against an American Jewish organization by a Jewish group. IfNotNow organizers believe their tactics are working, pointing to a decline in the number of young Jews participating in Birthright trips in recent months. J Street U, J Street’s college affiliate, announced earlier this year that it would organize a free trip to Israel this summer that would include visits to Palestinian cities in the West Bank and meetings with Palestinian activists. The group’s protests of Birthright have found plenty of detractors, with critics pointing out that Birthright is a free trip that is entirely voluntary. Some critics have even called on IfNotNow members who walked off Birthright trips to reimburse the group for the cost of the trip. The protesters gathered early on Friday morning in Bryant Park before marching through midtown towards Birthright’s offices at 8:30 a.m. 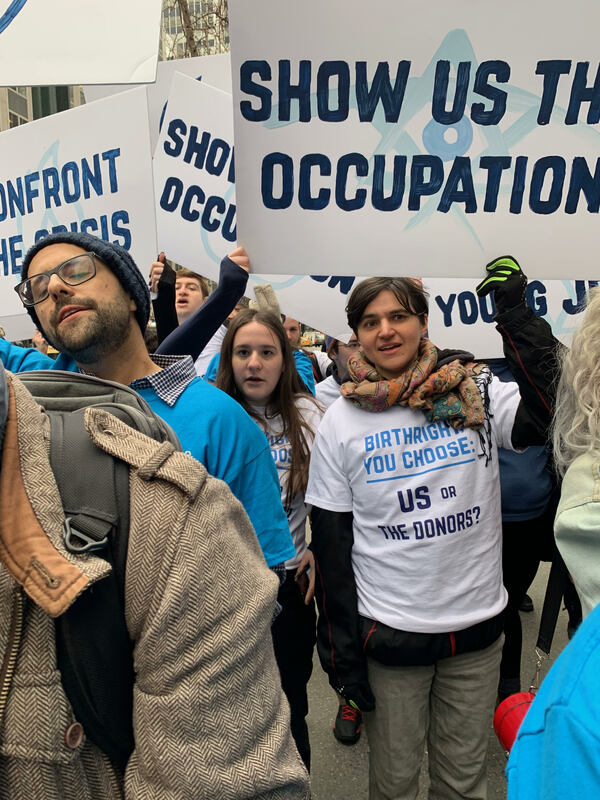 They sang as they marched past New Yorkers heading to work, singing protest and labor organizing songs as well as “We will build this world with love,” or “Olam chesed yibaneh” in Hebrew, a favorite song of Jewish social justice groups. Two groups of protesters descended on Third Avenue just before 9 a.m., with one group linking arms to block traffic at 44th Street and the other doing the same at 45th Street. For about 15 minutes, traffic on Third Avenue came to a halt with the sounds of honking cars and buses sometimes drowning out the protesters’ singing. Police arrived and ordered the protesters to move or face arrests, clearing the street by about 9:15 a.m.
At the same time, 15 protesters, all college students, locked arms in front of Birthright’s office building, blocking people from entering the building, while other protests spread out along the sidewalk holding signs and chanting. Over the next hour, the protesters used a megaphone to tell stories about their experiences as participants and leader on Birthright trips while dozens of police officers, local news teams and onlookers assembled in front of the building. Two counter protesters held their own posters nearby, one of them draped in an Israeli flag and shouting back at the protesters. By 10:30 a.m., all of the students blocking the office building were arrested and loaded onto police vans.